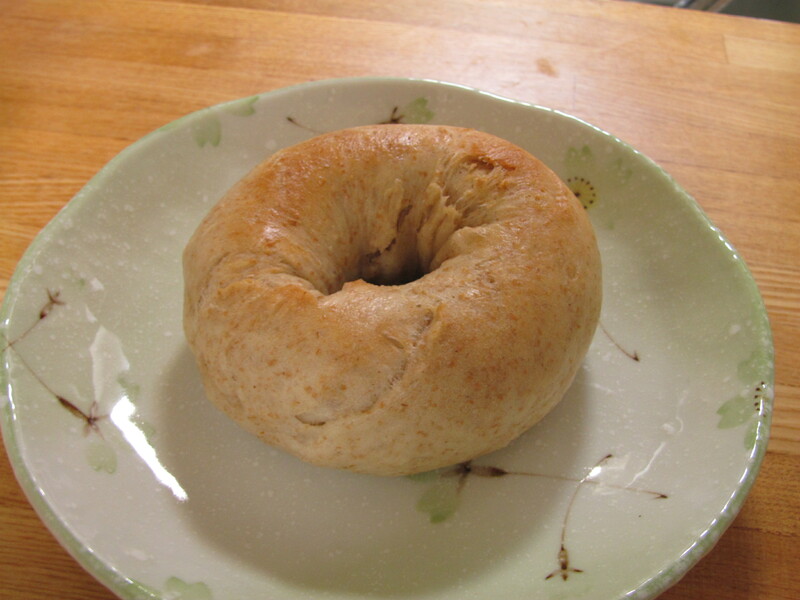 ベーガル革命: Whole-Wheat Bagels – I'll Make It Myself! Back in my language-school days at Midd, a New-Yorker foodie friend got on my case for eating the dining-hall bagels, telling me, “That’s not a bagel. That’s a piece of bread shaped like a bagel.” It’s probably for the best that he doesn’t find out what sort of things pass for “bagels” in Japan–it’s more like “cake shaped like a bagel.” Sometimes you can get passable bagels in the chain bakeries of Kanazawa, and Kaldi Coffee sometimes has imported frozen bagels, but they’re a bit pricey. Either way, it’s not just like popping over to Espresso Royale for a fresh Barry’s Bagel during an intense paper-writing session. Bagels are one of those foods that seem very intimidating in part because of the multi-step process of making them: using yeast, letting the dough rise, shaping, boiling, and then finally baking; and in part because you really never need to make them in the US when they’re so widely available. I had been meaning to try to make bagels since June when I bought yet another “make bread and sweets with veggies” cookbook, but the heat of the Ishikawa summer and the stress of the move were not the best motivators. I kept saying I would make bagels after I moved. Then it was after I got paid. Then after the temperature dropped. What actually motivated me was a friend, part of my band of expat foodies. She found an easy bagel recipe online and brought some over as a pre-hike breakfast. Afterward, she practically set up a bagel factory in her apartment, bringing awesome variety bagels to dinner parties and movie nights. A couple weeks ago, she loaned me her latest cookbook, a collection of bagel recipes from several bakeries in Japan. Bagels do take some time and effort, but, like salsa, guacamole, and yogurt, they’re actually quite easy to make on your own, even if you work full-time. Maybe the best thing about this recipes is that you can make bagel sandwiches with it–no more crying over shokupan sando! I like mine with smoked salmon, cream cheese, and spinach, but baked tofu, grilled chicken, or pesto with lettuce, peppers, or whatever else you can easily find in your local grocery store would be excellent, too. (See Serving Suggestions.) Also, these bagels are vegan if you are a yeast-eating vegan. Perfect marks on the bottom. This recipe is adapted from Atelier Brunnen’s “Rye [Bagels]”　(「ライ麦」） from Bagel Recipe Handbook (『ベーグル　レシピ　ハンドブック』), p. 110. 1. Mix the bread flour and whole-wheat flours together. Put the brown sugar and yeast on one side of the bowl and the salt on the opposite side. 3. Mix with your hands to fully incorporate and knead about 6 times. 5. Roll out to a length of about 10 x 18 cm, then use your fingers to roll the dough into a long cylinder. Attach the ends and smooth out any seams as best you can. Set on your cookie sheet, cover, and let sit in a warm place free of drafts for 20-30 minutes, until the dough has risen somewhat. 6. While waiting on the dough, boil water in the pot (deep enough to submerge 1-2 bagels). 8. When the dough has risen and the water has come to a gentle boil, boil the bagels for 40 seconds each. I usually do two at a time, but it will depend on how big your pot is. Carefully remove with tongs or a slotted spoon and set on the cookie sheet. 9. Bake for 18-20 minutes or until golden brown. The outside should be springy but the inside soft. Cream cheese (kurîmu chîzu, クリームチーズ) is easy to find in Japan, and both Snow Brand (yukijirushi, 雪印) and Philadelphia are good, though you will not find low-fat or reduced-calorie versions here. Smoked salmon (smôku sâmon, スモーク・サーモン） is available in the meat section of some groceries, usually with the sausages and other prepackaged, pre-cooked meats. *I recommend making 4 bagels if you are planning to eat them with a spread or 6 if you plan to make them into sandwiches. **In late autumn through the spring, I usually set the microwave to go for a minute when I start cooking, then set the dough in there later since it will be slightly warmer than the kitchen and draft-free. Pingback: Tomato Challenge: ALL the Tomato Recipes « I'll Make It Myself! Pingback: Hug Chai Works: Get Your Bagel Fix in Kanazawa | I'll Make It Myself! If I can’t get japanese whole wheat flour, can is substitute with other flour? Pingback: Coconut Muesli | I'll Make It Myself!